2015. 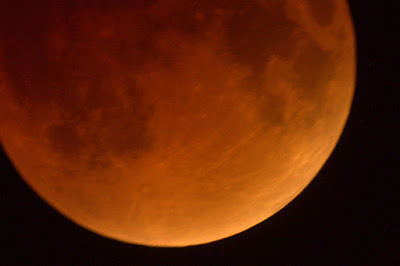 The year the Sun smiled and the Moon bled. Back in March, we in the UK had the fantastic opportunity to witness a solar eclipse. It was a chance that was far too good to miss, so earlier in the year, I booked the day off in advanced, hoped for good weather, and committed myself to travelling to a location around the country where the forecast was most promising. I needn't have worried. The weather was perfect, and I set up for observing not too far away from Hay on Wye with my observing mate, Jim. 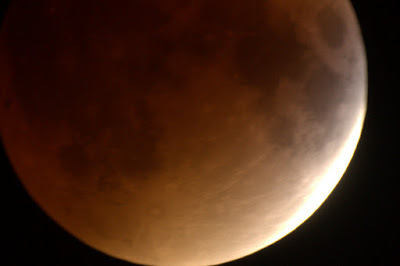 Back then, I didn't appreciate that later the same year, we in the UK would have the chance to view another eclipse This time, a full lunar eclipse. This time, no need for booking time off work, just the case of being happy to get up in the early hours, and also, once again, hoping for good observing weather. Once again, the weather was perfect for observing here. Still, and clear. For once, I wasn't concerned too much about errant light around the garden given the target for the session. 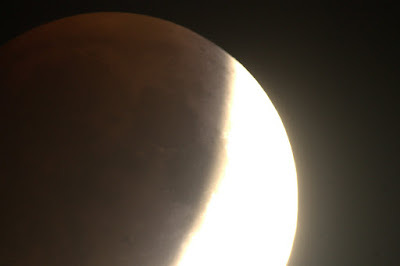 The lunar eclipse happens when the Earth comes directly in between the Sun and the Moon. 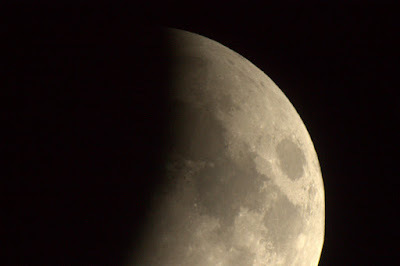 The Earths shadow is then cast fully on the surface of the Moon. 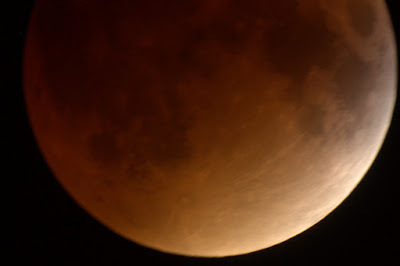 As a side effect of the Earth having an atmosphere, light from the Sun is diffracted as it passes the Earth, and has the effect of casting a red light on the surface of the moon. 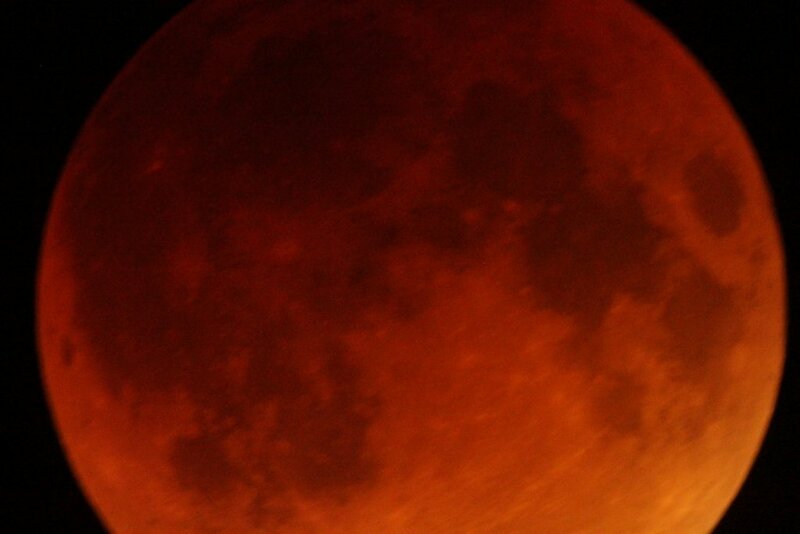 I set the alarm for 02.00 BST and when it went off, took my DSLR and eyepiece case outside. 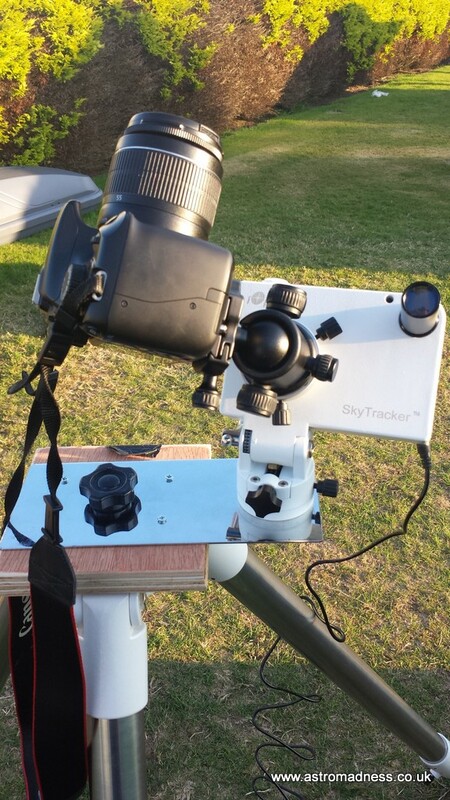 I set up the SkyWatcher 150p on the tripod and performed a quick collimation check. This, incidentally, is the same scope I used to observe and photograph the total Solar Eclipse back in March. 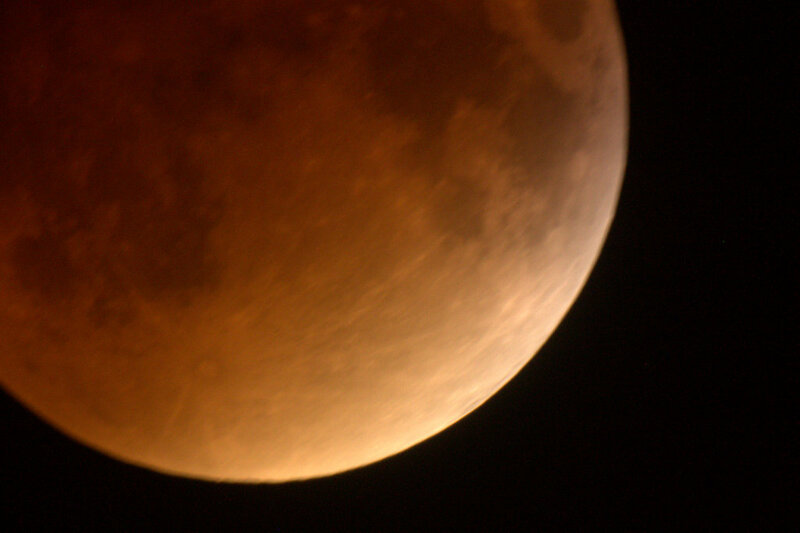 By this point, the shadow of the Earth had just started eating into the edge of the nights full moon. Orion was climbing into the sky, and the constellation of Taurus was starting to put in an appearance. One disadvantage of this setup is that when my DSLR is attached to the scope, I don't have enough inward travel on the focuser to bring the image into prime focus. The means I need to introduce a x2 barlow lens into the focuser, and then connect my camera to that. This is the only way that I can achieve focus with the kit that I have. It gives very good results, but what it does mean is that the target (in this case the Moon) is too big to fit in a single frame. The eclipse is certainly underway, but no sign of diffraction of colour yet. Visually, some red was beginning to appear. But, to allow the camera to pick it out, I had to change the exposure time and ISO settings. This started to being out the colour, but had the effect of over-exposing the surface area not yet under shadow. 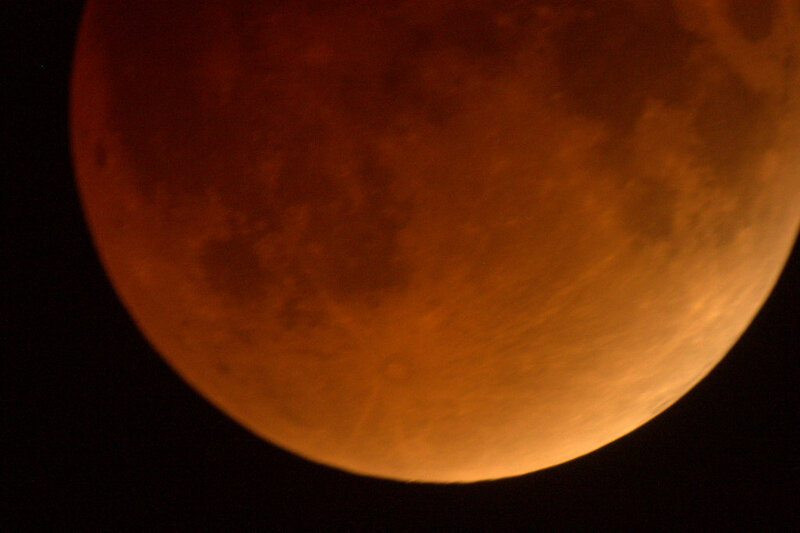 The whole of the moons surface is now under some for of shadow, The red colour now starts to become very strong. The last signs of grayness have now dissipated and the red light is increasing. Approaching totality. 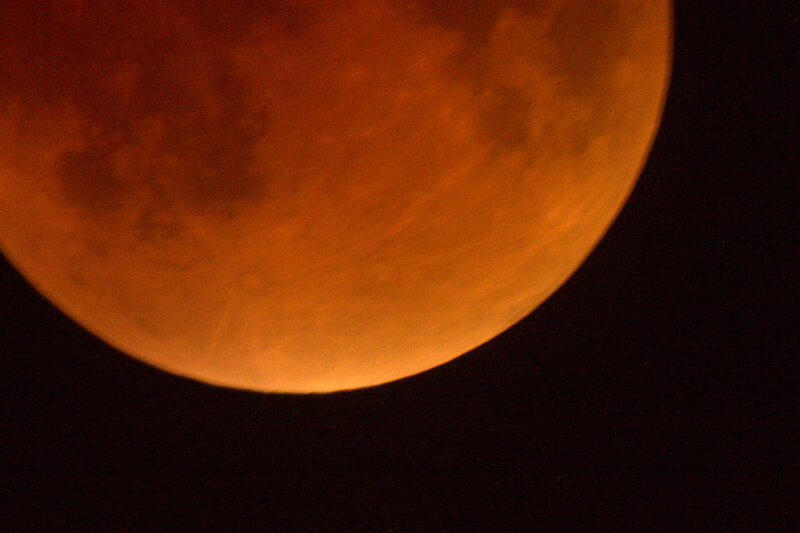 The exposure time had to be increased further to bring as much colour out as possible. 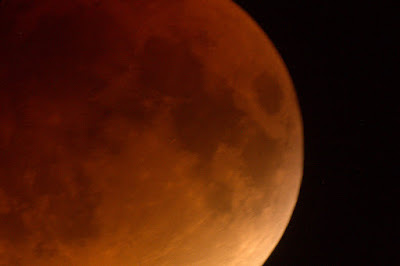 But, exposure times couldn't be set too long as I have no automated tracking, and the moon was moving quite swiftly through the field of view of the camera. I finished up the session around 4.00am because I needed to be up at 6.30am for work. A long day lay ahead! 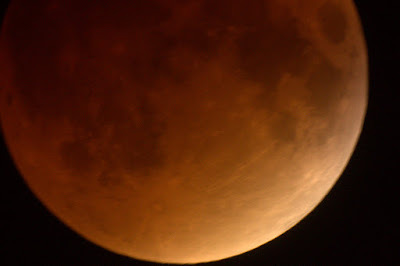 The next time we will be able to witness a lunar eclipse will be in 2033. I shall look forward to it, and hopefully have the ability to improve on the photographs. We've had an incredible amount of luck for these two events. Both have been stunningly clear conditions and well worth making the extra effort. 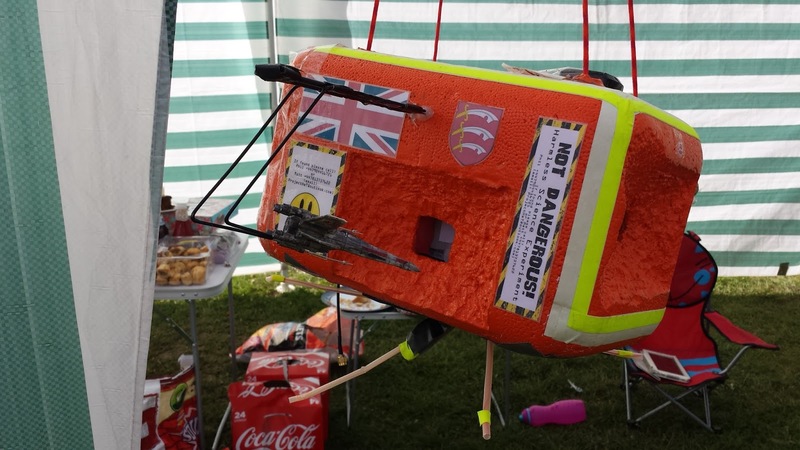 Both events have caught the public's imagination this year and it was great to hear so many others taking an interest on what was happening. Some Pages from the AstroCamp notebook. Following from my summary of AstroCamp, I wanted to flesh out the observations I made for the record, as, in part, this is what my blog is for. Seeing conditions were brilliant for the Saturday night. The light cloud that was flowing up the valley and around the mountains dissipated as the dusk approached and darkness fell. I had set my scope up on The Common in amongst everyone else’s scopes. It’s from here you can really get a great sense of the communal observing that makes AstroCamp quite special. It was obviously going to a wet dew ridden night as the signs were there from the outset. As soon as the sun disappeared, the moisture levels on the ground increased. In preparation for the dew, I used my home made dew shield for the Telrad, and I must say, it actually worked really well and remained clear throughout. My first target for the evening was M57, the Ring Nebula. Easily found in the constellation of Lyra, the pale smoke coloured ring stood out against the background of the darkening sky. I wanted to go and find some new targets where possible, and, due to bad planning, I didn’t have a copy of my target list with me. So, I went from memory and from the notes that I already had in my book. Next object observed allowed me to give first light to two new pieces of kit. The 40mm Explore Scientific 2” eyepiece, and the 2” UHC filter. I bought the eyepiece specifically for the large nebulae that seem to overspill out the edge of the field of view of even the 32mm Panaview. I turned the scope to the region of the Veil Nebula and popped in the eyepiece. I wasn’t disappointed. I specifically looked at the Western Veil as I had seen the Eastern previously, but not been able to make out the Western aspect of it so well. That night was a different story though. The whole of the shape fitted in the field of view of the new eyepiece, and the UHC filter aided vision exceptionally well. 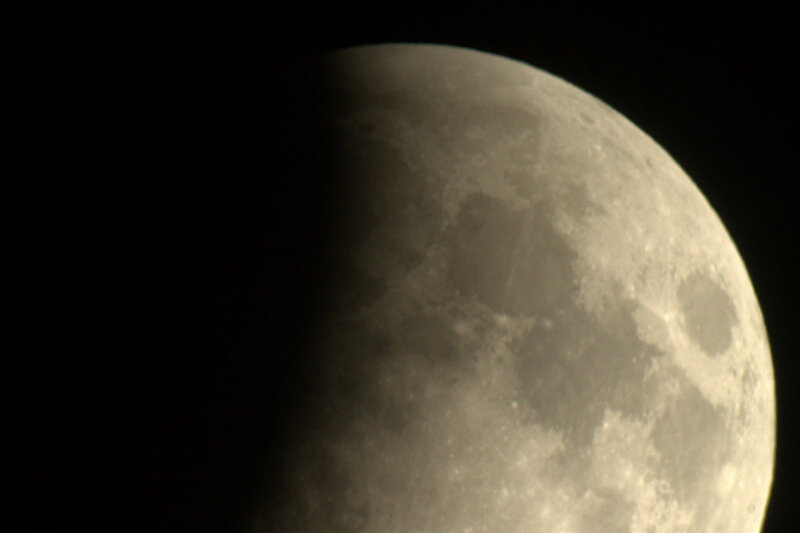 It was a lovely wispy grey coloured curving through the eyepiece, and can only be described as quite awesome. I did take a quick look at the Eastern Veil and was equally impressed, but I had earned the first new tick of the night. Another nebula in the region of Cygnus is the North American nebula. This is very different, and appeared to me quite dark, almost only identifiable to me by the lack of stars in a rather extended patch of sky when compared to the rest of the background sky in this busy region of the Milky Way. The UHC filter didn’t help at all in this instance, perhaps because the nebula appeared too dark anyway. I assume that this is what I was looking at. I checked and re-checked my navigation using the Telrad and Sky Atlas, and come to the conclusion that this was definitely the correct area. I decided to move on and looked through my book of overlooked objects and noticed NGC 7635, the Bubble Nebula. There seemed to be a nebula theme developing to the evening, which I was quite happy with to be honest. I found the Bubble Nebula, although I did find quite hard to pick out at first. It was surprisingly smaller than I expected, but then most nebulae look small after looking at the Veil I suppose. I used the 40mm EP to start with and was helped a little with the UHC filter. I decided to change down to the 25mm BST and use the OIII filter with that to get an idea of the difference between the filters. I must admit though, I struggled to pick anything out of note, so decided that the UHC filter was the better tool for the job. It was now that I took a little break from my list of targets and my own mission while I spoke to some visitors to the site. I’ve recounted that part of the evening in my main AstroCamp post, so won’t repeat myself here. During the evening, there were many meteors seen, of all different characteristics. Very quick and short trails, to trails stretching miles across the night sky. If only I was able to capture them on camera! Unfortunately, it was then that I noticed problems with the secondary on the SBT starting to mist up with dew. I knew that this would be the end of the session as I don’t yet have any form of dew heater or additional prevention. It was a big shame given the conditions, but some good observations were made. 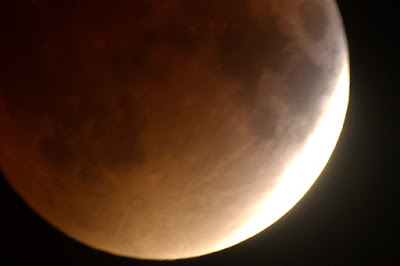 With the weather forecast for the final night of AstroCamp not looking particularly good for observing, and the main events all over, I decided to put in the call home for a lift back that evening. It meant that I could pack up all my camp kit in the dry and have the day at home to sort it all out again. Nevertheless, the forecast for Tuesday was brilliant. After feeling quite rested and awake from my weekend, I decided to set the SBT up out the back garden. This time, I made sure I had my full list of new targets with me, so was able to be a bit more specific. The evening consisted of picking out the smaller targets around the popular constellations of Cassiopeia and Cygnus. First object of the night was a Caldwell. C10/NGC 663 is defined as an open cluster. From what I could see, it seemed to be a pretty cluster of pairs of stars. The stars were much too far apart to be called true double stars. It soon became apparent, that the use of my Star Atlas and the Stellarium app on my phone would be needed to positively ID the targets. I was happy to be able to identify stars HP 8305 and HP 8325 at the edge of the cluster giving me an excellent start to the session. Next I moved onto another cluster. NGC 654 was very easy to locate, but pretty tricky to see if that makes sense? I was able to confirm it using the positions of HP 8014 and HP 8106, but most of the cluster only began to reveal itself after a few minutes at the eyepiece. In all, I could make out around 15 to 20 individual stars. “A very small open cluster with a dozen to 15 stars visible with averted vision”. It can be found only around 1 degree lower than my first target of the night. The only way I could confirm that I had found the target was by the presence of 44 Cas and HP7989 nearby. A tough, but well-earned tick indeed! Whilst scanning around for another target, I accidentally came across NGC 7789 which is a large open cluster, but one that I had viewed before, so after a brief look, I moved on. I decided to give IC 1396 a go, another nebula. My main point of reference for this many deem a target in itself. Herschel’s Garnet Star is a lovely sight and was almost at zenith when I looked at it. I have only seen it once before, and it was nice to come back to it again to be reminded of why it is so popular. I was battling the curse of the outside light from two neighbours that evening, and try as I did, I never did get to see my original target of IC 1396. Maybe next time. Finally for the evening, I moved to Cygnus where I wanted to locate NGC 6910. A small open cluster. It was a great find, and quite unusual. It consists of several lines of stars linked up to form a miniature constellation of its own almost. The visible stars were quite equidistant apart giving it the appearance of a somewhat uniformed structure. 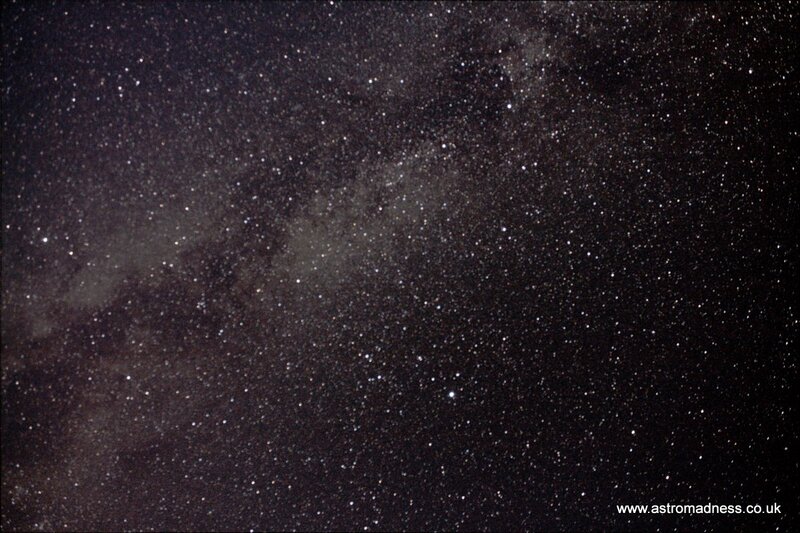 It is very easy to find too, being about only 1 degree away from Sadr, the centre star in the cross of Cygnus. That brings an end to the more detailed observation notes of the last couple of sessions. Thanks for taking the time to read through them, and feel free to comment or subscribe to future posts. The morning of Saturday 19th September heralded the start of AstroCamp. A gathering of amateur astronomers from all around the country in the small village of Cwmdu, just outside of Abergavenny in the Brecon Beacons. This was my second visit, with my first being in May of this year. 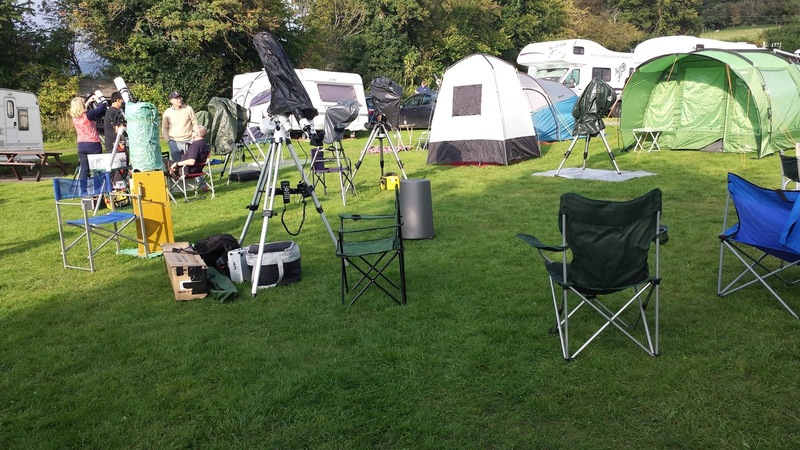 AstroCamp is renowned for being the friendliest star party in the UK. Back in May, I had such a good time, I vowed that I would sign up again for September’s event. I met people who were all too ready to accept a stranger in camp, and they soon made me feel at home. Regardless of the fact that we only had a matter of a couple of hours observing over the whole 4 days in May, it was because of the friendly nature of everyone that I wanted to go back. This was a theme that continued, and that I also wanted to help other first timers experience. I like to think that I contributed to just that. This camp like before was exceptionally well organised. The team behind the camp are found here. This month, we had some excellent skys on the first night, which I have put together a quick report on later in this post. On Sunday, we all descended to the newly named Spiral Arms which is the name given to Cwmdu Village Hall when we take it over for the afternoon. The main idea of this part is to have a good time, listen to some excellent talks, to test your astro knowledge against the main Pub Quiz, and then the final Masters of the Universe quiz. There were two talks this camp. The first was from Matt Kingsnorth, Flight Director from the ESA (that’s the Essex Space Agency by the way!). You might have seen the YouTube video below trending this Summer. He was one of a partnership that run a project to launch a craft into space, collect data and photography, and to retrieve the craft on its return to Earth. All for £1000. Oh, and there one or two other reasons too… This is their story. “@bad_robot #HeyJJ Don't forget the premiere tickets for @MattKingsnorth & @TurboBungle” Let’s see if we can get them those tickets! The second talk of the evening was by Jenifer Millard @JeniMillard. This was the third time that Jenifer had been guest speaker at AstroCamp. Jenifer has just returned from the AAO Siding Spring observatory in Australia where she worked on the Huntsman Eye project where the intention is to use off the shelf canon optics to photograph the sky. The talk was opened with an introduction into the history of astronomy. Of particular interest was the Aboriginal peoples thoughts on astronomy and what they attribute to the different constellations, although I gather from talking to Jeni that this sort of information is becoming harder and harder to learn and record as it’s sadly becoming lost in the midst of time, permanently being consigned to forgotten history. For more information on the project, visit their Facebook page at https://www.facebook.com/HuntsmanEye?fref=nf for links to videos and project news. If you ever get the chance to listen to Jeni at any event, please do so. You won’t regret it. Previously, I posted my intended target list that I wanted to have a go at finding whilst at AstroCamp. I took these from various books, charts and publications I have around. So, out of a target list of around 46 objects, I set the SBT up on The Common in the middle of camp, and set to work on what was to be the best night for observing over all the main days of camp. The sky was brilliant and just what I have come to expect from rural observing. That night, I managed to tick off only 3 new objects from my list, but I actually observed 6 or 7 objects in total. Also during the night, whilst holding my eye to the telescope, there were many “ooooh” and “aaahh” sounds coming out from everyone else as we witnessed a mini meteor shower. An awesome site. Part of observing on The Common is to take part in the communal observing aspect of camp. Shouts of “ we’ve got Saturn” early on the evening lead to a steady stream of people heading to one corner where someone had managed to see Saturn before it sunk below the welsh hills and out of sight for the rest of the evening. This was then followed later by John on Bob the Dob proclaiming “I’ve got the Veil Nebula”. This resulted in a small crowd teetering on a step ladder in the pitch black, craning their necks to look through the eyepiece. While all this was going on, I spent about 40 minutes talking to a couple who weren’t part of AstroCamp, but who were staying on the campsite. Their names were Bart and Lisa (no Simpsons jokes please – although I did resist the temptation to ask where Homer was…) and they were Dutch. I don’t think they had ever looked through a scope before, so I was more than happy to give them a brief tour of some of the more well-known targets for the evening including The Ring Nebula, The Western Veil and of course, Andromeda. My observing though was sadly brought to an end comparatively early, especially as the clear skies were due to remain for several more hours. By 11.00, I started noticing some of the brighter targets were becoming harder to focus on, and eventually wouldn’t come into focus at all. I shone my torch onto the secondary mirror, and my fear was confirmed. Dew had begun to settle on the mirrors surface, and with no way of moving it, that was an end to my visual observing for the night. I moved the SBT back to my tent and noticed various other people were beginning to suffer similar issues. But, I had a reserve idea up my sleeve. As I was packing away, I noticed the Pleiades were beginning to rise about the surrounding hills. They were visible from out the front of my tent, and so I decided to get out the camera and tracking mount for half an hour or so to see if I could get some pictures. I didn’t want to set the laptop up because of the light shining and possibly upsetting other observers, so I stuck to using the screen on the back of the camera. I managed several shots of various length exposures. They weren’t amazing, but there is definitely potential there to give me some good results later in winter. The night also give me chance to get first light on two new toys. A beast of an eyepiece, the 2” 40mm Explore Scientific and also the 2” UHC filter. Most impressive! And so, the closing plea. If you’re on social media of some sort, track down these people, give them a follow, and think about coming to AstroCamp some time. You don’t need any kit, just a sense of humour, and not to be scared when a stranger comes up to you in the middle of the night with a red torch and asks you if you fancy a peak! Good evening reader, and thanks for taking the time to stop by and browse. It's been a few days since I returned from holidays in Cornwall and the experience of some good quality clear skies. I've had the chance to look through the photographic data that I collected while there, and run it through some processing. I've dabbled with Deep Sky Stacker and GIMP before, but nothing serious at all. I felt that I now had some data worth spending a bit more time working with. I split my photography into 4 different sets. Each set using slightly different settings on the camera. In the grand scheme of things, I haven't collected a huge amount of data per set, but all in all, a total of around 11 minutes of exposure per picture which has given me enough to work with. My camera is an unmodded Cannon EOS 1100d with standard twin lens kit. All stacking was done in Deep Sky Stacker 3.3.4 and some light processing in GIMP 2. Both these pieces of software are free, opensource available to download for Windows and Linux. Set 1 was the first run I did with the iOptron Sky Tracker. I must admit, I wasn't really concentrating on the picture taking, more what was going on with the equipment. So, it was no surprise when reviewing the data that the images were slightly out of focus. For this set, I just pointed the camera up into the milky way somewhere. Again, not concentrating on any particular target. Set 1 comprised of 18 frames of 30 second exposures shot at f/4.5 ISO-800 at a focal length of 18mm. I also took 5 offset/bias frames and 5 darks, Though out of focus, there is some very good definition of the dust lanes coming through from the spiral arms of the Milky Way. With a bit more confidence in the process, I moved onto the second set. Sticking with 18 frames at 30 seconds, this time, I changed the other camera settings to F/5, ISO-1600 and twisted the lens to a focal length of 46mm. I used 5 bias frames and 4 dark frames. I also changed the position of the camera pointing it vaguely into the constellation of Andromeda. 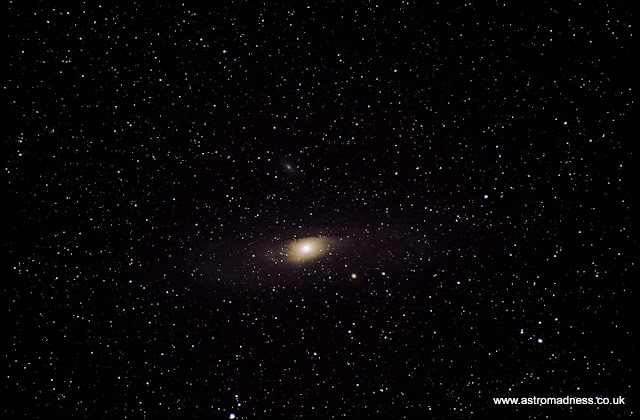 The result being that you can now see the galaxy of Andromeda beginning to emerge against the background of other stars. I was starting to struggle with dew appearing on the lens of the camera. This is going to prove to be more of a problem when trying exposures measuring many minutes each during the course of a few hours at a time. I decided to change the lens to the 300mm lens that came with the camera and continue with the trial. I left the camera pointing to the same area of sky, and chose to amend more of the camera settings. This has allowed be to build up a comparison of similar pictures in similar circumstances, but using different settings. It will help me decide what to use in the future for better results. This time, I used 19 frames (must have lost count somewhere!) and 5 bias and 5 dark frames. I worked at a focal length of 80mm, f/4.5, ISO-1600. This time, the finished product has a better dark background which helps show off the stars and the galaxy. Finally, I decided to try picking out Andromeda in more details. Achieving focus when doing this type of photography is quite time consuming, and so having a laptop with remote shooting abilities on hand allows me to take a series of photos, zoom in on the photo straight away and make any focus adjustments required. To do this, I left most of the camera settings alone, but cranked up the ISO setting to as high as it could go on my camera. In this case, this was ISO-6400. Once I had achieved the best focus I could in the conditions, I prepared the camera for the final set of pictures. Set 4 consists of 18 frames with 5 bias frames and 5 darks. The settings on the camera were changed to f/5.6, ISO-6400 and the lens set to a maximum focal length of 300mm. The final product is quite please for a first attempt at astrophotography at this focal length. During processing, I could see through the curves that there is plenty of data there to be worked with. However, I need to hone my processing skills to bring the data out visually in to the final photo. 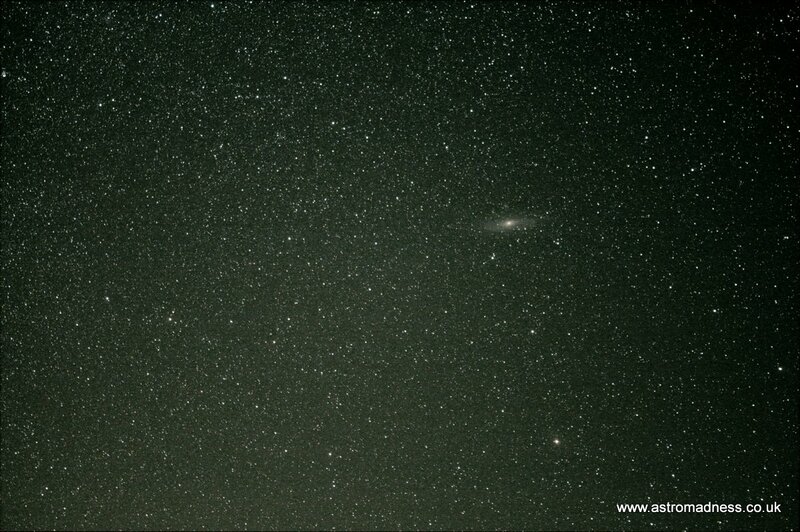 This picture shows the core of M31, the Andromeda Galaxy quite nicely. The extended galaxy is also visible as a lighter surrounding to the core. This is made up of stars, gas and dust all being held within the gravitational pull of Andromeda. 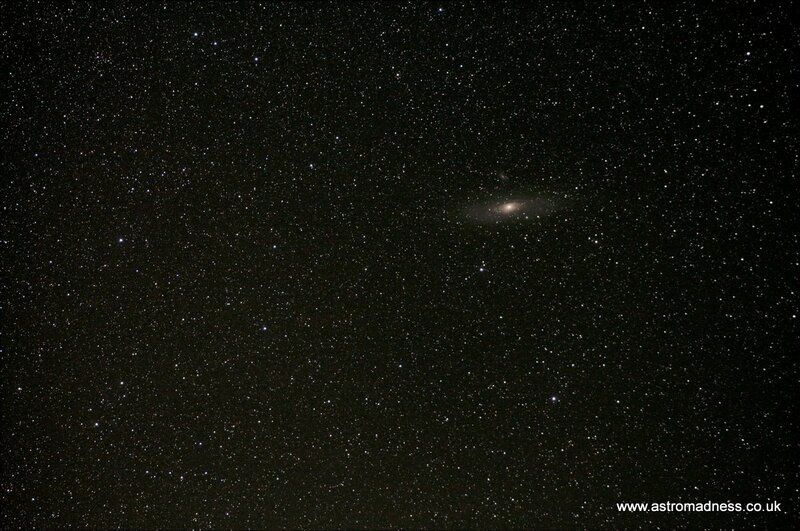 Also visible is the 2nd galaxy of the pair, M32. 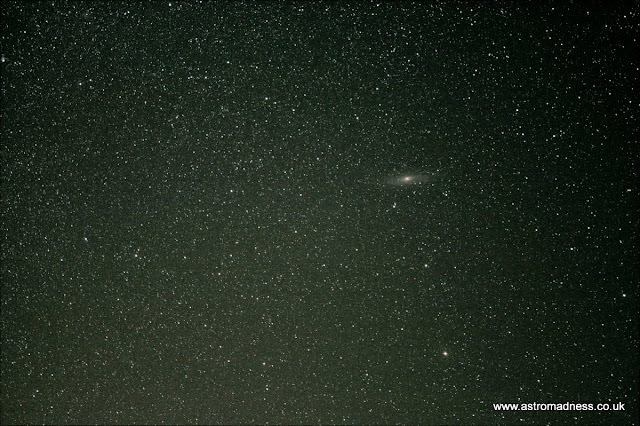 In this picture it can be seen just below and to the right of the main core of Andromeda. Its a pale orange in colour and could be mistaken for a slightly larger star when compared to the others in the vicinity. And finally, directly above the core of Andromeda, another galaxy designated M110. Again, pale orange in colour, the core can be picked out, along with the outer edges of the galaxy. These 4 photos represent one evening of photography in excellent conditions, then followed by several evenings of stacking and learning on the hoof basic processing skills to get them this far. As I develop my processing and photography skills, I'll post more results. I've already got a few targets in mind, and with winter approaching, there are others that will keep me occupied through the start of next year. Hopefully, I'll have chance to attempt a couple of clusters in Hercules, and possibly some larger nebulas too. The weather forecast was looking OK although there were signs of passing high level cloud. The forecast did say that it would get clearer as the night went on. So, time to pull out the 150p for the evening again. After the exploits of tracking down cluster in Sagittarius, I decided to re-visit some Summer favourites. I hadn't observed anything in Hercules since last Summer, so this was to be my first port of call. I wanted to remind myself of the clusters in the area with a view of photographing them with the tracking mount at a later date. My first target was M13. It proved to be very tricky to locate given the amount of cloud that was around. I had noted in the book that I possibly wouldn't have set up under the same conditions at home. It is a lovely cluster to look at, but it wasn't showing itself off in its normal splendor because of the atmospherics. Still, the first for the night. Staying in Hercules, I moved onto M92. Conditions being as they were, it was tricky. But, I still was able to start resolving individual stars. The clarity of the image was wavering slightly as cloud passed across the constellation. With longer at the EP, I might have been able to resolve more detail, but it was certainly to be a night of just grabbing what you could! I noticed Lyra was reasonably cloud free, so a quick visit to M57, the Ring Nebula in Lyra to see a brilliant, almost smoke ring, appearance of the nebula. Then, quickly moved through Cygnus to Sagitta and M71. This is an open cluster, and on this particular night, well worth the description of the feint fuzzy! I think I did really well to pick this one out given the conditions. I was able to resolved 2 stars in the vicinity of the cluster, but not much else. It was still pleasing to get this one under the belt though. 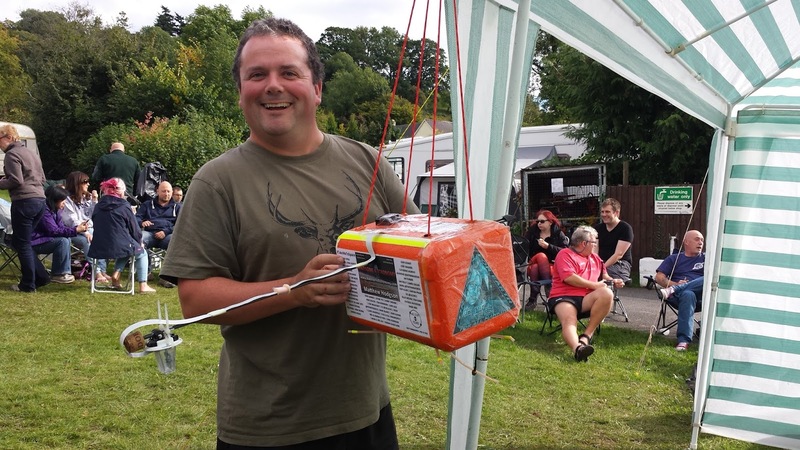 It proved that even though conditions were really becoming quite tricky, it was worth the time and effort to get to targets around the sky. "Looking in the sky atlas for other targets around Aquilla/Sagitta, I saw a large open cluster referred to in the book as "Brocchis Cluster". A quick check on Stellarium didn't ID that name, but @25mm I could recognise the shape of the star cluster..."
While view Brocchis cluster, I noticed a small feature near by. I assumed it to be a catalogued target, so I check in the star atlas and found that it was designated NGC 6802, a small mag. 8 cluster. I was quite chuffed with this find. And the fact that I was seeing magnitude 8 objects in these conditions. Just two more objects were observed that evening. M11, The Wild Duck cluster was the first of these. It can be found in the constellation of Scutum and is a very pretty, but condensed cluster showing a single stand out star in its centre. Of course, more aperture and better conditions might well bring out more, but I can only note what I was able to see on the night. Finally, M26, a supposedly large mag. 8 object again in Scutum. However, I say supposedly, as I could see the object, but in relative terms, compared to other target, it seemed quite small. I observed it using the 25mm EP to get an idea of comparison to other targets. The 25mm EP had been the one of choice for most of the evening. I will need to revisit this under better conditions, and hopefully with the SBT to gain a full appreciation of what it has to offer. In a return to some wide-field astrophotography, I chose to set up the camera, the mount and the laptop again for another go. This time however, I wanted to look at it's potential for giving me more immediate results. To do this, I concentrated on the JPEG photos that were being taken, and the settings that would allow me to get as much detail as possible in a single shot. This is as opposed to multiple frames being stacked and processed at a later date. I felt that the best way to do this was to concentrate on a specific constellation. One that would fit into the field of view of the camera, and that would be recognised with relative ease. I have found that previously, when photographing the night sky, that it is possible to get so many stars show up in the frame, that it's difficult to identify the constellation itself. My first target was going to be the constellation of Lyra. It's currently high up in the Summer nights sky by 9 or 10pm meaning that there is less atmosphere for the light to travel through before entering the lens of the camera and going on to hit the sensor. I found that the best way to make sure that I had the whole constellation in frame was to set the aperture of the camera to as low as setting as possible, and then to set the ISO as high as possible. This meant that I could take reasonably short exposures, see the results, carry out any tweaks to the position of the camera, and perhaps the most important thing, to carry out any focus adjustments. Once I was happy with this, I was then able to reduce the ISO setting, having the effect of reducing the background 'noise' in the picture ensuring that the stars were exposed, but the general background was much darker. This give much better contrast, but took longer to get the shots that I wanted. Below, I've put together 3 images taken during the process. The first shows the outcome of the test shot for alignment and focus. The second is one is annotated with the names of the stars that make the constellation, with some lines to see how the stars are connected up in the constellation picture. Finally, the third image is without annotation. Once I had taken these pictures, I began to study them to see if I had caught anything recognisable within the constellation. I was amazed and really pleased to find that I had caught a feature in the bottom part of the constellation. The positioning is correct and therefor, I found that I have caught the fine M57 - The Ring Nebula. In a photo, it looks fairly unimpressive, other than appearing in my picture as an electric blue spot, which could easily be mistaken for just another star I suppose. I've pointed it out on the marked picture to help readers see what I am referring to. It is apparent that on top of the actual waiting around for exposure time to pass, astrophotography is generally a very time consuming activity. This makes it all the more important to get things as good as possible before committing yourself to taking your final shot or shots. The next constellation I looked at was Cassiopeia. Again, the process I followed was to take several test shots for positioning and focus before moving onto a longer exposure. I also changed the ISO value to a higher setting, but also decreased exposure time on the final image so I could compare the effect this has on the final single shot outcome. The first image is annotated, and the second is the original. The final photo does show some signs of apparently being out of focus. This might have been the case, but the biggest issue I had was trying to keep the lens free from dew. Once I had cleared the dew, I only seemed to get a couple of minutes before finding the lens was misted up again and an exposure of any longer was pointless. There is a definite difference in picture, despite taking into account the issues with dew. My conclusions from the experience gained taking these couple of shots is that the f/stop number is about right. Keeping it reasonably low seemed to work well, although the reasons why I don't really know much about at the moment. The biggest difference come in the ISO settings. A lower ISO meant the image for a one off exposure appeared much cleaner. A better contrast was given between the light from the captured stars, and the darkness of the background sky. And finally, the exposure time helped determine how much important data was captured by the cameras sensor, and helped bring out individual stars better. From here, I think given a reasonable opportunity, I would like to look at another constellation, or at least part of one. Perhaps the great square in Hercules, which also contains some clusters. With the right ISO settings and exposure time, I would like to think that I could start to pick some of these details out. I would like to try exposure times of 5 to 10 minutes. This would test out the tracking abilities of the mount, and also my polar alignment skills! In addition to Hercules, I think Delphinus might also be a worthwhile target. A small constellation that could fit within a single frame in its entirety. For now though, I shall need to pack the mount away ready for the journey home. Eeking out the last of the Summer after schools have started back, in the peace and quiet of our favourite campsite on the Roseland Peninsula, is beginning to become an enjoyable habit. This is the third time we have been to this site and every time, we've been lucky with the weather and it has allowed some time for observing under clear skies. But, this week in particular has been better than the rest. Having been before and knowing what to expect, there was no question of wondering if the scope would fit in the car, but more of, what will I leave behind if anything to make sure the scope does fit. I haven't been able to bring the SBT with me this week. There had to be some compromise! But, the 150p and the EQ mount stand in as a very capable travel/holiday scope for weeks just like this. I set it up just outside the tent, checked collimation after the journey and settled down to watch the sun go down over the field next to the campsite. Then, it was just a case of leaning back in the chair and spotting the first stars to come out. Deneb put in an appearance almost directly over head, then Ursa Major started to emerge from the darkening sky. I haven't made any sort of checklist or specific list of targets for the holiday, and was quite happy to just go with the flow. Whilst waiting for the last of the daylight to disappear, I remembered that Saturn has been around throughout the Summer, and I wondered if it was still view-able. I checked out its position on Stellarium, and sure enough, though relatively low, I could make it out with relative ease. That was the first decision made. I haven't seen Saturn for around 2 years because of my observing location at home means that there are various hills and buildings obscuring the view. It was good to see it again, first at 25mm, and then at 8mm and finally 5mm. 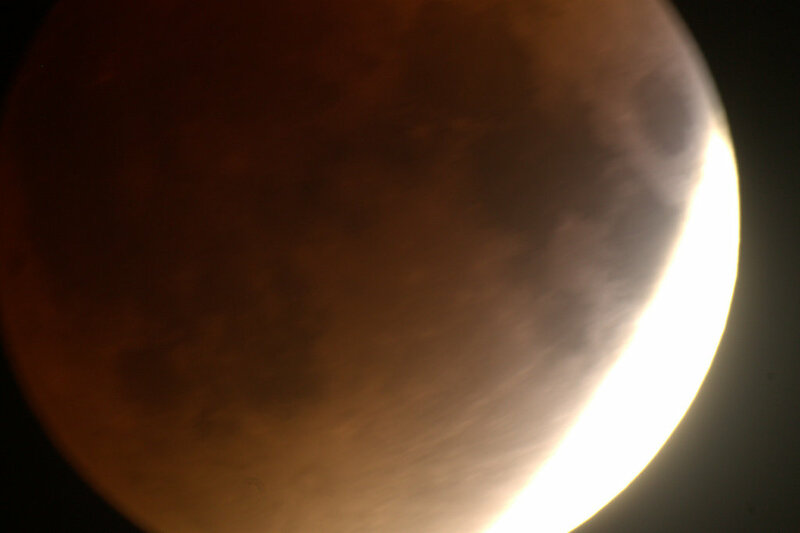 8mm gave the better view of it in this case. I found the 5mm EP wasn't quite sharp enough, and the seeing conditions out over the horizon towards the see meant that the planet wavered in and out of focus. However, conditions did allow me to see some small specs of light dotted around the planet, which I later found to be some of the moons of Saturn. However, as tricky as it was, I wasn't able to identify them individually. This got me thinking. If I could see Saturn from my position now, what else would I be able to see that I would otherwise struggle to observe from home? I ran through my list of Messier objects that I still need to tick off the list. By far, the single constellation that has the most within its borders is that of Sagittarius. I started to check out the various charts and star atlas to compile a brief list, and then I got to work. First up, M8. This is an open cluster associated with some nebulosity. This is also known as the Lagoon Nebula. At mag. 6, it's within the capability of the 150p with some ease. Although, I did often wonder what it would look like through the SBT. The cluster itself was nicely visible, and I did see some nebulosity through the 25mm EP. I decided to try the UHC filter in combination with the EP. Did the filter make a difference? Well, yes it did, but not much. I felt the cluster lost some of its definition a little. I think it was border line improvement/hindrance to be honest. Nevertheless, the object could be marked down as seen. M21 was next on my list. Sagittarius is home to many open and globular clusters, This cluster was well defined against the backdrop of darkening skies. I could resolve approximately 30 stars in the cluster, although I don't doubt at all that the cluster itself contains many more stars than that. Still, it's nice to see a cluster where you can resolve individual stars. Many clusters appear more as smudges of light through the 150p as I was reminded throughout the session. "The SBT would obviously help, but just having a first look about the teapot asterism is awesome." M28 is among the easiest of targets to find in Sagittarius. It can be found within a couple of degrees of the star Kaus Borealis, the top of the teapot if you like. However, making it easy to find doesn't mean it will be the easiest to observe. M28 is another globular cluster, but one that I struggled with. At mag. 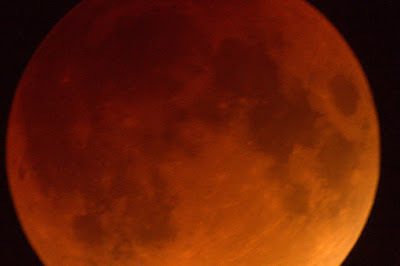 7, again, within the capabilities of the 150p, I found it hard to resolve, even with averted vision. I decided to take a break from star hopping around Sagittarius and moved on to M9 in Ophiuchus. This is yet another cluster, but at mag 8, was going to start testing the limits of my 150p. Happy to work with what I had brought with me, and put some time and effort into searching these objects out, I tracked it down. Star hopping to the area where it can be found was fairly straight forwards, but picking it out was incredibly tricky. At first, I thought there was an problem with focus, but regardless how I tried, I couldn't get this one part of the field of view into a sharp focus. However, I noticed the surrounding stars were coming in and out of focus accordingly. This was the only way I could determine that what I was actually looking at was M9. Remaining in Ophiuchus, I moved onto M10 and M12. I've decided to pair these together in terms of observation notes for they appeared very similar to me. Both clusters were quite intense at their cores. but faded quickly. The backdrop to the cluster consisted of 10 or so individual stars that probably are not associated with the clusters. I did find myself having to double check M10 when I first observed it as I thought I could start to make out some spiral structure to it. I re-checked the charts and noted that it was a cluster and not a galaxy. That will be my tired eyes playing tricks on me then! Tired eyes indeed. It was nearing time for me to turn in. But first, there was just time to take in some other Summer favourites. M27, the Dumbbell Nebula appeared grey and wispy set among hundreds of individual stars. The Ring Nebula, M57 was just a short hop away. I viewed it with the 25mm and the 15mm EPs. The nebula is a brilliant target to observe, even with smaller magnifications. Spending some time at the EP will help to resolve the ring structure of it, but I couldn't make out the central star with the 150p. Another job for the SBT! Just as I was about to start packing, I turned to the North East and could make out Cassiopeia easily. I allowed my eyes to wander down towards the the constellation of Andromeda before settling on a patch in the sky. The Milky Way had been visible all night, arching direct above my through Cygnus. I refocused and stared for a while as this patch slowly come out to define itself against the darker backdrop. What I was looking at was Andromeda, the spiral favourite of many an observer, and an easy 'wow' moment when introducing people to the world (or should that be universe?) of visual astronomy. Moments later, the 25mm EP was in, the Telrad was pointing straight at it, and there it was. An excellent way to end a first night under clear Cornish skies! This holiday hasn't come soon enough. We've both been looking forwards to this break for months. We've returned to Tretham Mill on the Roseland Peninsula in Cornwall for a camping holiday with our dog Gelert. Cornwall's night time skies are fantastic if you can get to the right place. We are far enough away from Falmouth that the only visible sign of light pollution is just above the horizon to our West. Other than that, the small lights that illuminate the road around the campsite are the only other thing that I need to contend with when it comes to astronomy. But that is easy enough given the number of hedges around the site, and with a bit of thought when positioning the kit. This time of year, the skies are particularly rich with DSOs that can be captured in a photograph using a normal DSLR camera. So, it wasn't going to be a night of chasing things around the night sky and ticking of targets from my list. Instead, I chose to just get to know the tracker and its capabilities a bit more. I plugged everything in, and connected my laptop to the camera so I could start live shooting and seeing the results straight away. Astrophotography can also take a lot of room on the SD card, so it was useful to be able to save the photos direct to the hard drive of the laptop. I took 4 different sets of photos, mostly around the Andromeda constellation. I decided to take them home for some stacking and processing. Depending on the results, I might post the results of that effort at a later date. 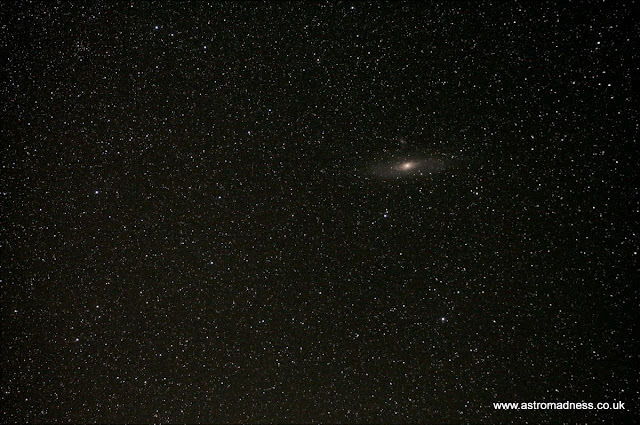 However, I did take a single exposure of the Andromeda galaxy that I was quite pleased with for a first attempt. So, that brought an end to the first night under the stars. The dew has caused havoc as it always does. I need to look at investing in a dew shield or dew bands suitable for the DSLR lenses. The problem with heaters though will be trying to keep the dew from settling, but trying to avoid warming the chip up in the camera. I love a bit of problem solving me!